I had the pleasure to attend an exclusive beauty influencer event featuring dermatologist Dr. Jeanette Graf. I was uber excited because I talk beauty and health all the time. I am happy and honored to join the community of bloggers, beauty and fashion editors to learn and educate our society about trends and important beauty topics. As a makeup artist and a person who takes pride in looking good, I am not here to just do makeup, but to be a resource and advocate for beauty. Let me begin by thanking Kimberly Porter for inviting me and congratulations to Geneveive Santos of Gorgeous on the Go and Karen Oliver & Associates for hosting such a beautiful and informative event. Dr. Graf is one of the most sought out experts on skin care in the United States. I am very familiar with her because I see her quoted in many top beauty magazines. 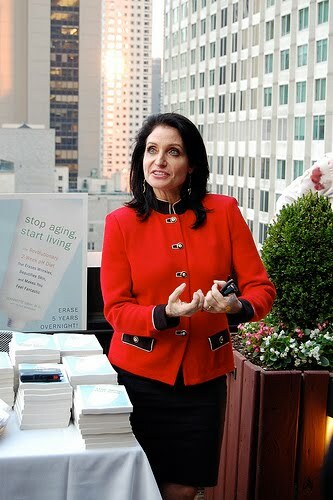 This event was to discuss her new book Stop Aging, Start Living and to introduce the Revolutionary 2-week pH Diet. I am a proponent of having a dermatology visit at least once a year and a firm believer that your food intake and lifestyle is key to your health and skin appearance. Dr. Graf not only reinforced my beliefs but gave me key information to solidify and measure my daily activities to ensure a healthy lifestyle and beautiful skin. I am in the process of reading the book, but the nitty gritty is that your pH level needs to be balanced to have youthful looking skin. No chemical, medicine, medical and/or cosmetic procedure can do the trick alone. Dr. Graf has discovered that through all her work as a dermatologist without proper digestion, joy, and proper pH balance your skin will be missing the beautiful glow we all want and seek to achieve. Your food intake and lifestyle must be in sync to achieve gorgeous skin. The appropriate pH level is 7. At the event a packet of pH strips were distributed and Dr. Graf’s book. I tested my pH level immediately and I was around a 7.5-8. Even if I was a 7, the information provided in this book is monumental and honey… I still got work to do! This is important to me because not only do I want to look good, I also want to be a resource to anyone who may have troubled skin. While I am not a dermatologist, I have used many skincare products and as a makeup artist I care about skin and its appearance. Check back to see my progress in taking on Dr. Graf’s tips. Depending on how I am feeling, I will let my brows grow out and rock a bold look. Bold brows still have definition and shape. It is not a big burly mess! Brows shape your face and in my opinion are the doors that invite people in. If you do your makeup and forget about your brows, you leave out an important aspect! To allow your brows to be more bold they should have a more medium/thick shape with a high arch. It is also important to make sure your brows do not grow to close to the nose. This will make you look very severe. Also keep in mind that you don't want your brow to be too far over so it looks abnormal. I suggest finding a professional to help you achieve your overall shape. Sometimes it takes a few months to allow your brows to grow out from the more modern thin shapes we see today. You can maintain your brows by using the concealer trick shown on www.stylecaster.com. Please be sure to not over tweeze. I am happy to have worked with Stylecaster. Their site is awesome. Check back to see more collaborations with us in the future.